GREAT DIESEL ENGINE, GREAT AUTO GEARBOX, BUT DOES THE PACKAGE LIVE UP TO ITS INCREASED MAX TOW CAPACITY? Boy was I having a good chuckle as I made my way out of Sydney with the NT diesel Pajero hooked up to an 18 and a half foot Jayco caravan. Blue Mountains, Bathurst and Sofala – here we come! Our team of testers voted the newly released NT as ‘first place’ in our very own 4WDOTY 2009, plus it’s scored a swag of other medals and ‘first in class’ awards. 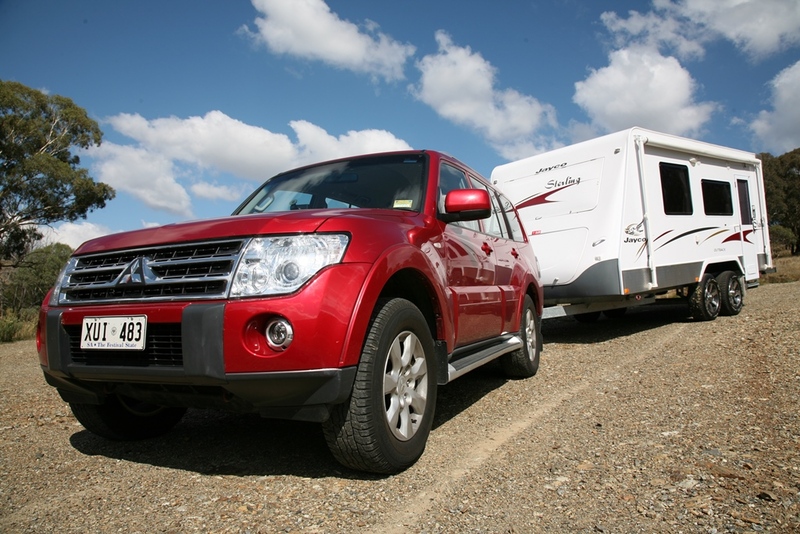 The upgraded tow capacity of 3000kg should (on paper) make it a serious contender for caravan and camper trailer towing duties, but unfortunately, we hadn't had the chance to hook anything of any substance to the Mitsubishi tow bar – until now! Impressive figures on paper often don’t relay into appropriate real life workings, but having put just shy of 500km under the Pajeros belt, the Pajero soon proved its towing prowess. It made short work of keeping up in peak hour traffic with effortless accelerating and braking manoeuvres that far exceed what a ‘small’ displacement diesel would have been able to do in the not-to-distant past. Yes, it did suffer a little turbo lag and automatic transmission delay as the right foot was pressed on the green traffic light signal with the early morning rush hour maniacs. That small delay is the only quibble you could pit against the brilliant-performing auto diesel combination, but hey – who’s in a rush while out touring our great lands? That aside, the auto’s fully automatic mode combined with tiptronic style manual changes made driving easy. Coming into tight corners out on the open road or red lights in the traffic, a quick flick to the left combined with one, two or three manual down changes (pulling the gear stick rearwards) enabled the engine / gearbox braking to take some load of the foot brakes – sporty gear changes in an auto with caravan in tow…who'd of thought it? With 147Kw and 441 Nm, the 3.2 litre intercooled turbo diesel had oodles of power to maintain not only all freeway driving, but also the hilly, undulating back roads that often required constant braking into corners followed by accelerating to the next. This engine was a delight to drive with and handled the 2000kg Jayco caravan with ease. The only ungainly experience was on the aforementioned back roads at speed, part way around a corner, with irregular bitumen surfaces forcing sideways movement onto the back end of the Pajero’s independent multi link coil spring suspension. Again, it’s a bit of nit picking and it was only evident on the more uneven patches and nothing too untoward for those familiar with towing larger caravans. Late braking into fast corners (as well as back in that terrible traffic light chaos) saw the Pajeros four wheel ventilated disc brakes handle the caravan easily – with of course the electronic brakes as fitted to the van. Long down hill descents (Victoria Pass in the Blue Mountains) never saw the Pajeros brakes fouling the pristine air with burnt brake pad fumes – especially as we were utilising the manual gear changing to alleviate some braking usage. It was possible to get the auto box a little confused during slightly undulating cruising with a little hunting for the right gear of third, fourth or fifth. 2000 RPM saw the Pajero hurtling at 100Km/h, with just a slight rise as it dropped back a gear. Keeping an eye on the centre dash mounted trip computer saw fuel figures ranging from 14.5 up to 18.0 L/100km. With a top up just prior to hooking up the Jayco and a refuel straight after towing duties, we used 77.72 litres of diesel for 463 km – equating to 16.8l/100km…pretty good considering the size of the caravan. Incidentally, the low fuel warning light first came on at 452km. At least the tank could be filled full boar with a fast flow nozzle until close to full, which then required a constant on/off trickle to get that last bit of diesel into the tank for a complete fill. Many people have claimed how quiet this latest model diesel Pajero is compared to the previous. Yes, it’s much quieter, but still lets out a good old engine roar on down changes as the tacho needle points towards the higher end of the scale. Some other Japanese vehicles are still much quieter than the Pajero and prove to be a more pleasant space for intimate conversations. One unnerving experience (happened five times during the day) was while using the easily-set steering wheel mounted cruise control; when set and climbing particularly steep roads, the box remained in a slightly too tall a gear, forcing the engine to labour, when all of a sudden the cruise control turned off or ‘un-set’ itself – most unnerving as it felt like a total power lose for a split second while the right foot was quickly jammed back onto the accelerator and the auto down-shifted to suit. The first two times, my mind was wondering if I knocked one of the controls, but after repeating the error (intentionally) it seems as though there may be some fault there. The standard Pajero seats provided exceptional comfort for one very long days driving, even without lumbar adjustment! At the end of 500km, jumping in and out for photos my back and dairy-air was in very good condition with no sign of back-ache or numb-bum-itis! Standard side rear view mirrors are excellent in size and shape to see most of what is happening to the rear with a van in tow, although extended mirrors would be of benefit. I love a good belly laugh and at the end of this tow test am happy to say that the Overlander group of testers made the right choice again this year, although increased cabin sound deadening should be on the cards for future versions. Other than that, the 3.2 litre Di-D Pajero should be a real winner with Overlanders who haul camper trailers, caravans, horse floats or any sort of heavy load. Thanks go to Jayco Sydney for the loan of a Sterling Outback 18’ 6” (5.65m) caravan. It tops out at 2005kg tare weight, with a 165 kg tow ball weight and has several design layouts to suit most couples and families. Over standard Jayco Sterling features, the Outback also incorporates an impressive 150mm x 50mm chassis and a 125mm x 50mm A-frame, with roller rocker suspension, 16 inch alloy rims with 225/75R16 tyres, off road electric brakes, protective alloy checker plate sides, rear spare wheel, plus an external hot and cold shower.